We all have different ideas about how to honor the dead. Different ideas of how to grieve. Different ways of moving on. But I do have some experience with losing people I love. And I say the right way to grieve ... is to however the hell you want. Levi: That was my first time. Today, doing Ortho stuff. Up until now, I have been focusing on General, and it never really felt right. I liked that. Ortho. You're a really good teacher. Nico: Wait, that was your first kiss? Owen: I wanted to be a dad my entire life. You know that. Owen: And Leo turned into Leo and Betty, and Amelia. Permalink: I wanted to be a dad my entire life. You know that. Link: Look at me! I'm here, Michelle. I'm alive. Michelle: So you had it and you survived it. Link: Unless I'm a ghost. Michelle: He's going to be so scared. Link: Yeah, there's going to be scary moments for sure. For me, the scary part was seeing my mom sad all the time and losing my hair because look at this hair. Do you have a relationship with your father? Why is it that the people who created us get all the credit? Just because they accomplished the most basic of biological functions they get a holiday named after them? Jo: I don't know if Alex will ever forgive me for this. Miranda: If Roberta dies, and you could have saved her, you'll never forgive yourself. Permalink: If Roberta dies, and you could have saved her, you'll never forgive yourself. I opened the door for him. I gave him a piece of my liver. I opened the door for him to get to know me and he didn't walk through it. The only time we spent together was when Lexie forced us to be together, and when she died he completely disappeared. I don't really need to grieve him because he's been a ghost for years. Mer: What's the story with you and Jo, does Alex have anything to worry about? Link: What's the story with you and Alex, does Jo have anything to worry about? Permalink: What's the story with you and Alex, does Jo have anything to worry about? Link: When are you going to let me take you to dinner? Jo seems to think there's something here. Mer: You know I have a matchmaker and she has a list. Link: How can I get on that list? 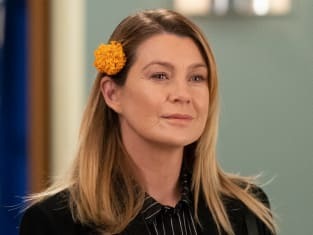 Mer: You're not the kind of guy that's on that list. Permalink: You're not the kind of guy that's on that list.